Eddie Flynn used to be a con artist. Then he became a lawyer. Turns out the two jobs aren't all that different. . . He vowed never to set foot in a courtroom again after a case gone disastrously wrong. But today Eddie doesn't have a choice. Because this time, it's personal. The head of the Russian mob in New York City, on trial for murder, has kidnapped Eddie's beloved ten-year-old daughter. Now Eddie has exactly forty-eight hours to draw upon his razor-sharp instincts and use every con, bluff, grift, and trick in the book to defend an impossible trial and save his daughter--or die trying. . .
and some savvy lawyering. Cavanagh keeps things hopping." "This is a super, break-neck book." "A fresh approach...A rush of double-crosses...and some savvy lawyering. Cavanagh keeps things hopping and writes a fine action scene." STEVE CAVANAGH was born and raised in Belfast before studying law in Dublin. He practices civil rights law and has been involved in several high profile cases; in 2010 Steve represented a factory worker who won the largest award of damages for race discrimination in Northern Ireland's legal history. Steve is married with two young children. 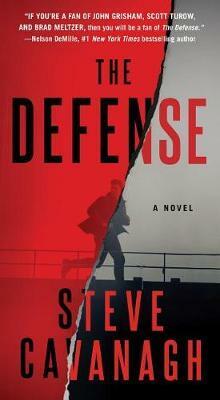 The Defense is his first novel.